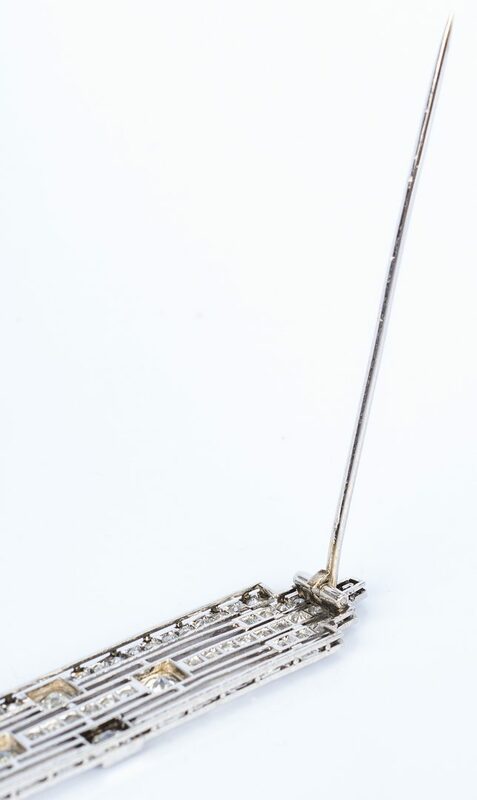 An Art Deco platinum diamond brooch in a stacked bar design, total diamond weight of approximately 1.97 ct, and containing four (4) 3.3 – 3.1mm mine-cut diamonds, SI2/I with total weight of approximately .49 ct and eighty-six (86) 1.8 – 1.5mm antique single cut diamonds, SI1-I1/GHI with total weight of approximately 1.48 ct. Platinum brooch has 14K white gold pin mechanism. 9/16" H x 2 3/4" W. 9.2 grams. Provenance: Estate of Martha Lyman, Dayton, TN. CONDITION: Overall good condition with some surface grime and wear.